The third meeting of the High Level Panel (HLP) on the Post-2015 Development Agenda was held in Monrovia, Liberia. The theme of the meeting was “National Building Blocks for Sustained Properity – Economic Transformation”. 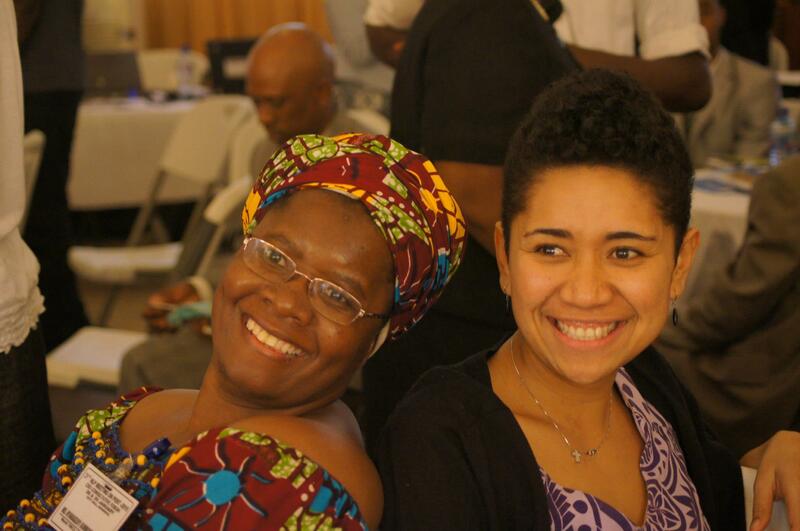 Jacque Koroi (YWCA of Fiji)a World YWCA Intern, who was present at the Monrovia HLP shares her observations from the experience. ‘Women Oh Women’ shouted the Minister for Gender, Liberia. ‘This is our time’ came the reply from women of different backgrounds in the audience. And together everyone shouted ‘Women, don’t just sit down, we stand up and do something positive with the men’. This was one of the many chants the Ministry for Gender put together as part of their women’s outreach programme. Liberia is a nation slowly moving forward after 14 years of Civil War (1989-2003) that left their infrastructure in ruins, families losing loved ones to the war and hurtful memories. Nevertheless a billboard on the roadside reminds everyone that ‘Liberia is on the Rise Again’. During my 10 hour plane ride to Monrovia, I sat next to a man, also a pastor and father. He had a very captivating story about how he took shelter in the bush with his family during the war to stay clear from the violence. During this time, his son got sick and he couldn’t take his child to the hospital, his son died. This man watched many of his people lose their lives and still found it in his heart to forgive the perpetrators and help to rebuild the nation. I also met a young man who is hoping someday to go back to school, at 27 he cannot read or write properly, and is working to support his younger bother in primary school. Apart from the history of the civil war, Liberia is the first African nation to have a woman democratically elected as Head of State, Her Excellency Ellen Johnston Sirleaf. Oh, and some women groups have also put a song for her called ‘Mama Ellen we Love you, Mama Ellen dats u, Mama Ellen you gave us dignity’, Oh Mama Ellen we love you’. I must say, it was really inspiring to be amongst the Liberian women as they sang, danced and were full of life. I got hooked and hummed the song to myself on the plane ride home, days later. Madame Ellen Johnston is also one of the three co-chairs of the 27 members of the High Level Panel appointed by UN Secretary General Ban Ki Moon. The other co-chairs are President Susilo Bamband Yudhoyono of Indonesia and Prime Minister David Cameron of the United Kingdom. In this capacity, Ms Johnston hosted the 3rd High Level Panel in Monrovia (Jan 28th– Feb 2nd). Two days had been set aside for a Civil Society Consultation with the High Level Panel. The World YWCA delegation consisted of our General Secretary Nyaradzayi Gumbonzvanda, Rosaline Toweh (Liberia) Nelly Lukale (Kenya) and I (Fiji). We were also joined on a few occasions by the President and Treasurer of the YWCA Liberia. It was an interesting meeting overall, and key outcomes included retaining a stand alone MDG on Gender Equality with additional targets and indicators, stronger attention on sexual and reproductive health and rights work moving beyond the GDP measurement to include the health and social well-being of citizens. The MDG review process is a critical time for the world, it will define our global priorities and direct resources towards achieving it, both human and natural for the next two decades. The World YWCA is engaging in the different consultations, and if you are keen, you can also lend your voice to the consultation process whilst time is still on our side.